In recent years, many ukiyo-e exhibits have taken place at home and around the world, and there is increasing interest in not only ukiyo-e designs but also ukiyo-e production techniques. 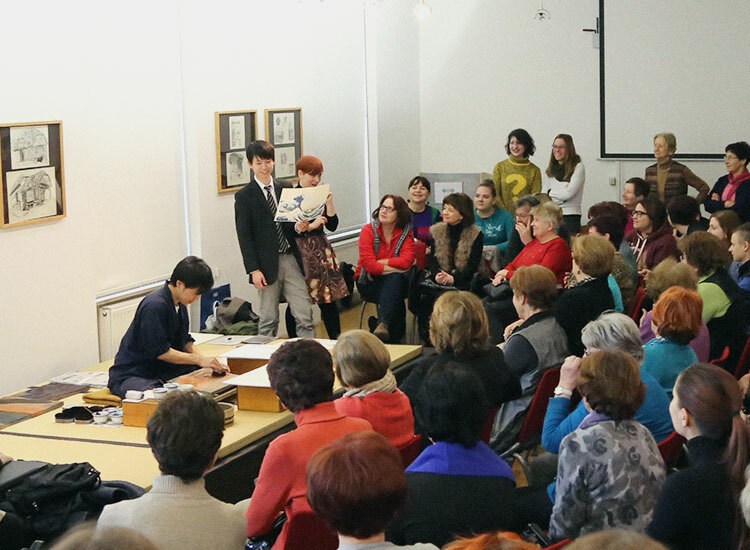 In response to the growing interest, the foundation organizes various publicity activities including demonstrations and woodcut printing workshops so that the public can experience and learn about the appeals of traditional woodcut printing techniques. At the request of people who wish to get a firsthand look at how woodcut prints are produced, we hold Ukiyo-e printmaking demonstrations about six times a year at the foundation’s permanent exhibition showroom in Mejiro, Tokyo. Woodcut printmaking workshops are held every year around October or November under the theme of “Make Your Own New Year’s Greeting Cards.” Participants can learn basic carving and printing techniques taught by artisans from the Adachi Institute of Woodcut Prints, the parent organization of the foundation.